A case of medulla compression from bilateral tortuous vertebral arteries in a 55-year-old man with pyramidal tract signs and lower cranial nerve palsy. This patient developed dysarthria, dysphagia, and unsteady gait over the previous 2 years. 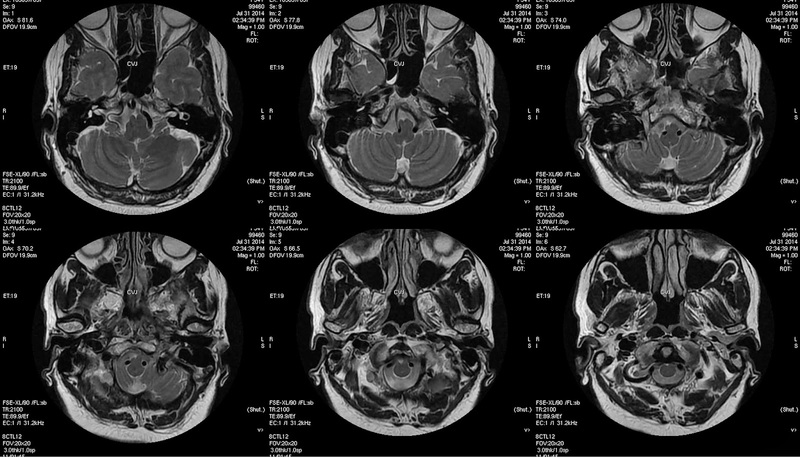 MRI Brain shows medulla compression by bilateral tortuous and medially deviated vertebrals at foramen magnum clinically corresponds to patients clinical complaints. Vascular decompression with Gore-tex sling creation around the vertebral artery was suggested to patient. Brain stem compression by “kissing vertebral arteries” is extremely rare. Only a few case reports documenting the clinical condition of patients, diagnostic features and therapeutic options are available in literature. Out of these reports the observed symptoms comprise hypertension, hemiparesis, tetraparesis, hemihypaesthesia, pyramidal tract signs, central sleep apnea and vertigo.